One of the first concerns people have after booking their family photo session is, naturally, "where we should take our photos?" Well, I’m here to tell you to stop worrying about that because I'm going to let you in on a little secret... Location just doesn’t matter. WHAAAAAAAT? Oh yes, my friend. It is true! Listen, I get it. It's a normal thing to think about. You've probably perused family images on Pinterest, or stalk your friends social media accounts to see where they have their photos taken. These are YOUR family photos. They should always reflect you as a family unit. Now, for some types of photography, it totally does. When you're on vacation at the Grand Canyon and you want to capture a shot of everyone standing in front of it smiling stiffly, then it's clear that the location is a big part of that picture. For newborn photos of babies in buckets against vinyl backgrounds and props galore, you will definitely want a studio photographer. But for me, for my type of photography, the location just doesn’t matter. The location adds very little to the image. Lifestyle or "life inspired" photography focuses on real connection between people. My goal is to capture your family as you are, and more importantly, the connection and love you share as a family. I want smiles, big ones, real ones, and when they happen, it's never my goal for you to remember where the picture was taken. It's not the location you want to look back on and remember ten years from now... its those precious moments I capture of family interaction. For outdoor sessions, the location is merely a place to meet. Family connection can be captured literally anywhere. 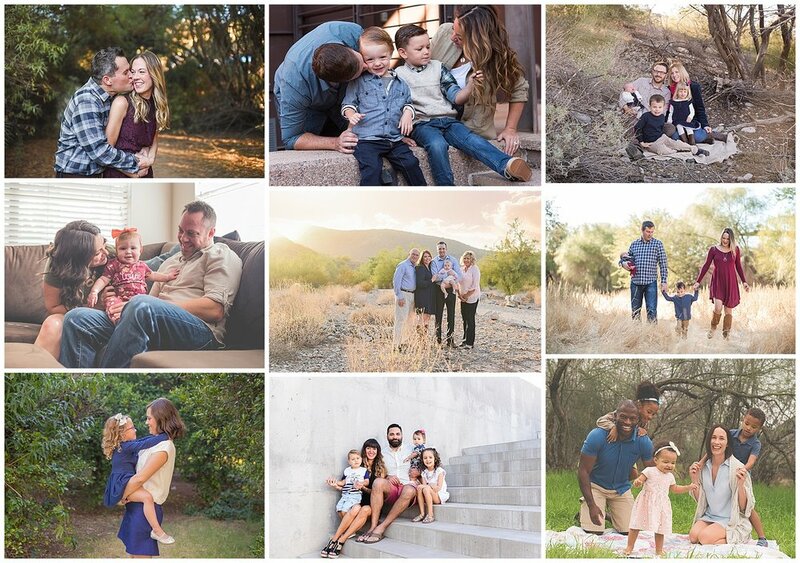 I have successfully shot at neighborhood parks, a field of tall grass (hey, that's the style some families want), the zoo, the Arizona Center, a Farmers market, a favorite hiking spot or they can happen in one of my favorite places to photograph families, in your home. In fact, if they do happen somewhere that you love and visit regularly, your family, and your children will be more comfortable. In-home sessions are where I get the most genuine smiles out of little ones, as they show me their favorite toys, and how they dance with mom in the kitchen. If they happen in an outdoor location where you adventure often, your children can show me around and explore, and I can watch their face light up as you talk to them about the special times you’ve shared there. So, my friends, location just doesn’t matter. You do. So close the instagram app, get off of Pinterest, and let’s talk about YOUR family. What location is sentimental to you? I guarantee those images will be some of your favorites.